Do You Know About W.R. Holway Reservoir? Located in the hills southeast of Salina, Oklahoma, the Grand River Dam Authority’s W.R. Holway Reservoir is a bit off the beaten path. Resting high above the Grand River valley, in a place where the river never flowed, the reservoir does not garner the attention that it’s “sister lakes” – Grand and Hudson – get from water enthusiasts. In fact, many consider Holway Reservoir one of the best kept secrets in the state. However, while its 712 surface acres of water and 21 miles of shoreline may pale in comparison to GRDA’s other lakes, the role that this particular reservoir has played in GRDA’s overall operations is an important one. Named to honor longtime GRDA Consulting Engineer W.R. Holway, the reservoir has also been known as “Chimney Rock” or “Pumpback” since its completion in 1968. That was the year GRDA also completed the first phase of the Salina Pumped Storage Project (SPSP); the hydroelectric facility that utilizes Holway’s waters to produce hydroelectricity. Holway was created when GRDA completed a 200-foot earth and rock dam in Chimney Rock Hollow. Using hydroelectric pump-turbines in the SPSP powerhouse, GRDA can fill the reservoir with water from the Saline Creek arm of Lake Hudson. The water is pumped from the creek, through the powerhouse, 250 feet up the side of a bluff, and into the reservoir above. In time when the water is needed for generation, it is released from the reservoir and flows back downhill, through the pumps, now serving as generators. Essentially, Holway’s waters serve as a battery for GRDA electric generation. Opened to the public and always a favorite of anglers, Holway is a favorite destination year-round. Although GRDA rules prohibit the use of internal combustion engines and swimming, visitors can be found using canoes, paddles and electric trolling motors to navigate the deep, quiet and clear waters. 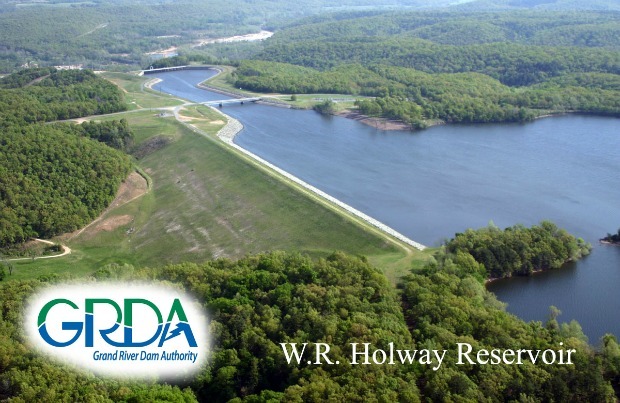 As is the case with all its hydroelectric facilities, GRDA reminds visitors to Holway Reservoir to be aware of the notifications around the facility. Signs, buoys, sirens, fencing and flashing lights are all intended to notify those in the area when floodgates are open, generators are operating or water is rising swiftly. Educating yourself on this signage and the reservoir area can help insure a fun, safe visit to one of Oklahoma’s best kept secrets. If you get a chance, check it out this summer.